It is really kind of sad, for one who has grimly enjoyed the unintentional Strangelovian surrealism of it all, to see the national security state's ham-handed efforts at WWII-style citizen warrior mythmaking breathe their last emphysemic gasps. I suppose the spin doctors in charge grew up watching late night replays of The Fighting Sullivans and the like — heroic tales of average American fellas who give it all up for the noble cause of freedom and Democracy. All as remixed through the (now quaint and harmless, almost nostalgia-worthy) age of California Über Alles, with its Top Guns, Rambos, and Chuck Norris-as-Bo Gritz craptaculars. Jessica Lynch has finally come clean, testifying before Congress about the true lies of her rescue attempt. Remember that one? The perfect 21st century descendent of Sgt. York — scrappy West Virginia girl in a convoy of mechanics that took a wrong turn in some Shiite southern province, blasting away solo at the Republican Guard, a working class Valkyrie who redeemed our lost valor. And the daring rescue by an elite squad, who conveniently had a videographer along for the show. In case you hadn't figured it out already, it was, to put it charitably, spin-doctored a bit. (News too late for the made-for-TV dramatization.) But hey, Matt Lauer is no Edward R. Murrow, because that's not what the American public wants anymore. 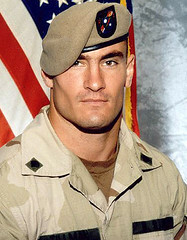 And then there's the Pat Tillman thing. The NFL player who quit the Cardinals after 9-11 to join the Rangers, only to get fragged by his squad on some Afghan moonscape. Subject to an elaborate cover-up complete with burned evidence and an unearned posthumous medal, until his savvy lawyer dad busted the brass. Conspiracy theories involving Tillman's nascent anti-Iraq War stance and planned meeting with Noam Chomsky (!) no doubt abound. The investigation of that one continues. - The guys who bombarded Iraqi officers with one-on-one cell phone psyops in the run-up to the 2003 invasion, implementing smart mobbing as counter-guerilla warfare. - The guys who blasted continuous loops of Barney and Metallica at detainees as a fun alternative to waterboarding (heirs to the masters of The Noriega Playlist). - The female interrogators at Gitmo who came up with such ingenious techniques as wiping faux menstrual blood on torn out pages of the Koran, flashed in the faces of their charges under the hot light. Those are some reality action movies that might actually get my patriotic hormones pumping. But the cyberpunks aren't in charge of our psyops yet (so far as we know).